"Alice isn't Alice." Those three words recently marked the start of an exciting series of discoveries for me and others. But what could they mean? Like a lot of cartoon researchers, I've long been disappointed that more of Walt Disney's 1920s Kansas City animation didn't seem to survive. Recently, though, colleagues and I have turned up some exciting discoveries—some of which, I'm pleased to announce, are about to reach public eyes after a long, long absence. First, a bit of background. Until recently, it was believed that only four of Disney's Laugh-O-Grams fairy tale cartoons still existed: Little Red Riding Hood, Puss in Boots, Cinderella, and The Four Musicians of Bremen (all 1922). It was also conventional wisdom that the fairy tales had been a series of six, released only in the United States—and perhaps only in part; for soon after buying the series from Disney, non-theatrical distributor Pictorial Clubs of Tennessee filed for bankruptcy. But Pictorial Clubs had shady sister companies in different states. Some, it turns out, continued to distribute Laugh-O-Grams years later; all seven of them, not six. 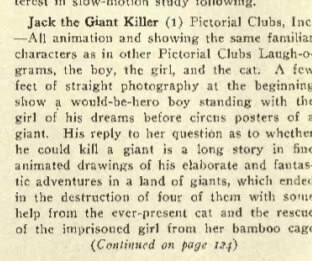 Jack and the Beanstalk and Jack the Giant Killer (both 1922), two titles traditionally misremembered as one and the same, were actually different shorts. 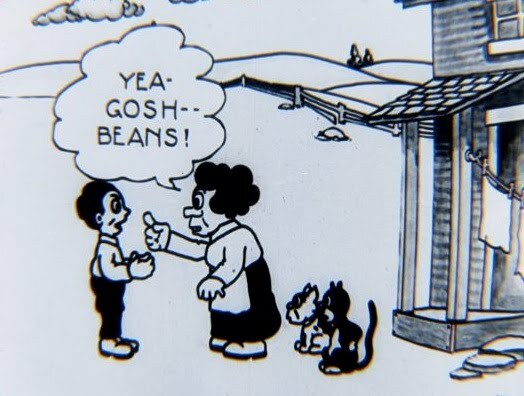 A 1922 press release, discovered by researcher Michael Barrier, announced that the series would include both titles; John Kenworthy noted the two titles listed as separate, completed cartoons among Laugh-O-Gram Films' bankruptcy records. As the sound era dawned, the seven fairy tales changed owners. 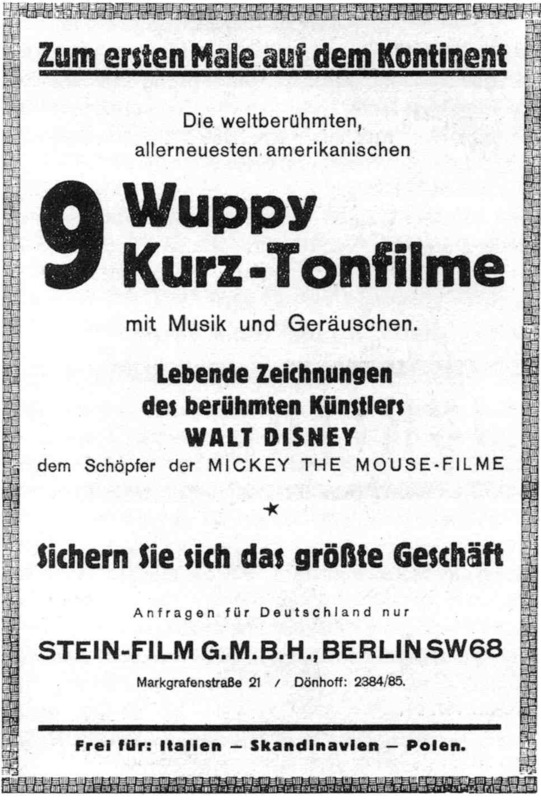 As early as 1991, J. P. Storm and M. Dreßler's pivotal German study Im Reich der Micky Maus included German release information for a 1929 Disney cartoon series entitled "Wuppy"; in his Animated Film Encyclopedia (2000), Graham Webb revealed an American equivalent alternately titled "Whoopee Sketches" and "Peter the Puss." 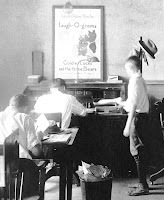 Bollman and Grant were credited as producers for the New York-based Sound Film Distributing Corp.; in England, Wardour Films distributed the reels theatrically. Webb was the first to verify that these Whoopee/Peter titles were Laugh-O-Grams retrofitted with soundtracks—with "Peter the Puss" being a new name for Disney's Julius the Cat (or his Laugh-O-Gram prototype). The Whoopee/Peter title "Grandma Steps Out" turned up in the collection of David Wyatt, and was clearly Disney's Little Red Riding Hood. Webb tagged Disney's Cinderella (1922) as the Whoopee/Peter "The Slipper-y Kid," Goldie Locks and the Three Bears (1922) as "The Peroxide Kid," and Puss in Boots as "The K-O Kid." But there were more Whoopee/Peter titles than there were Laugh-O-Gram fairy tales. Some records suggested 12 Whoopee cartoons were released; nine made it to Germany, and Storm/Dreßler and Webb collectively found title listings for ten. Would we ever actually see the films to conclusively identify them all? "Alice isn't Alice." In 2005, researcher Cole Johnson told me about having screened a misidentified cartoon at the Museum of Modern Art. Though tagged as Disney's Alice and the Three Bears (1924)—as it had been since its acquisition, decades before—this cartoon didn't feature a live-action Alice, as was SOP for the Alice Comedies. Instead Alice was animated. Or was it Alice? Cole believed we were seeing Goldie Locks, and the print title, "The Peroxide Kid," guaranteed it. Exceptional find, Cole. Where one retitled print existed, might there be more? Sure enough. In time, MoMA proved to possess other previously unprovenanced reels that, when inspected, revealed Whoopee and/or Peter main titles. Now the discoveries, and confirmed identifications, flew thick and fast. Two Whoopee Sketches, "Rural Romeo" and "Egg-Splosion," turned out not to be Disney shorts. 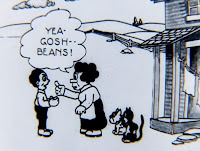 As for those that were, we already knew "Grandma" was Red Riding Hood and "Peroxide" Goldie Locks; now "The Four Jazz Boys" was confirmed as Bremen, while helpful MoMA staffers found for me that "The Cat's Whiskers" matched Disney's Puss in Boots. Of course, if "Whiskers" was Boots, then Webb had been incorrect with one title assignment. What was "The K-O Kid"? MoMA had a film element bearing that title, but it was not screenable when I did my initial research last fall. 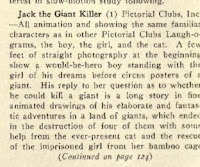 Luckily, a 1969 MoMA plot synopsis survived—and matched up point for point with a 1924 review of Jack the Giant Killer (above), which I'd located in The Educational Screen non-theatrical exhibitors' magazine. Shortly after, another print also turned up at MoMA; now elements of both have been combined and Giant Killer properly restored and preserved. In the shuffle, one might have forgotten Jack and the Beanstalk, on which no element has yet turned up at MoMA. With luck, however, I did locate an element in a private collection last spring; once again under its Peter the Puss title, "On the Up and Up." Thus all seven Laugh-O-Gram fairy tales have now been found. Want to see some? Sure you do. And that leads me to more good news—some will be screened, and soon. This October 31 will bring us a Halloween treat: longtime silent film scholar and fellow cartoon researcher, Serge Bromberg, is coming from Europe for MoMA's annual To Save and Project festival, and he'll be presenting a special Laugh-O-Grams program. Along with now-preserved prints of Little Red Riding Hood, Puss in Boots, and Four Musicians of Bremen, the newly discovered Jack the Giant Killer and Goldie Locks and the Three Bears will also be shown. Serge will provide his usual stellar background info and piano accompaniment. And as icing on the cake, later Ub Iwerks cartoons will also be at the screening, including Flip the Frog's Techno-Cracked (1933) and my personal favorite, Don Quixote (1934). Can't make it on the 31st? Come on November 4. This is one time when cartoon research has gotten great results—for Cole Johnson, Serge, the MoMA staff, and myself. Any other points to add? Yes: together with Beanstalk in the private collection was a print of Cinderella, restoring a long-lost final scene (at right) coming after the end of Disney's current element. Looks like Cindy and Prince Charming didn't live happily ever after. "Bottle of Rum" = ? Anyone got that "Bottle of Rum"? LeChuck? Jack Sparrow?... Bootleg Pete? Special thanks to J. B. Kaufman, Tom Stathes, Timothy Susanin, Michael Barrier, Didier Ghez, Leonard Maltin, Jerry Beck, and Thad Komorowski. I marvel at the research. Bravo to you all. Great detective work, all of you! Awesome! So not only have 'Jack and the Beanstalk' and 'Jack the Giant Killer' been confirmed as separate titles, but they've been discovered, along with 'Goldie Locks' and a lost ending to 'Cinderella'. This is fantastic work and a fascinating story to read. I suppose it's too early to say if they may be a complete release of the Laugh-O-Grams on DVD? Wow, these prints look great! So far they have lived a great story to share. Hopefully a few more titles will be discovered that way- It'd be tempting to say that a similar story originated the discovery of "Vulcan Entertainis" and "Masquerade Holiday", but I may be wrong. I reiterate the kind words I have left on Cartoon Brew, and here's hoping one of you guys will uncover something great. David, this is amazing... Congratulations to all of you with rewriting history! It just goes to show that 'animation historian' is indeed one of the most important professions we have:) I hope Disney will acknowledge your work with a special edition DVD... it deserves to be seen by audiences around the world. Very exciting David, judging by the frame above one can assume that the famous 1922 photo of Walt at his drawing board at Laugh-O-Gram shows him working on Jack and the Beanstalk. Mesterius: Thanks for your praise—but it's not all me. I found two of the three "new" cartoons, but only because Cole Johnson had found the first—and because Graham Webb had done the earlier research that enabled all of us to some degree. If I tried to take credit for all of this, it wouldn't be remotely fair. Mark: Do you mean this photo? The image on the drawing board there definitely isn't from Jack and the Beanstalk, in which the action takes place in rural farmland and on a treeless world in the clouds—and in which Julius stays at home while Jack goes on his adventure. While I still haven't seen the restored film (which, in this case, has only very recently become viewable), I suspect the drawing board image comes from Jack the Giant Killer, in which much of the action takes place on an island (see the palm trees) and where Julius accompanies Jack (see Julius to Jack's left, with his tail in the air). On Halloween we'll see if my suspicion is correct. Please let me know if you are correct. Although it is no doubt a publicity photo, it's tanatlizing to think that here is another piece of animation in which Walt himself had a hand. Is Brian Webb the British collector and archivist who collaborated with Dennis Gifford?..If yes, is he the man who had recorded the just discovered lost Peter Cook and Duddley Moore tapes? Oscar, I'm confused. I wrote about Graham Webb, not Brian Webb. Either way, I'm afraid Peter Cook and Dudley Moore aren't my cup of tea, so I don't know whether either of these Webbs has been involved in locating their works. Amazing! Great detective work all around. I learn something every time I visit. Great research and important. Another amazing piece of research. Just amazing and enjoyable. Your blog is one of the rare ones. Merry Christmas, David. Thanks, Mykal. Same to everyone! But what's rarest about my blog is the number of chances I've had to update it lately. I've got so much to share; all that's standing in the way are the world's most exhausting freelance deadlines! So that leaves us only with "Bottle of Rum" to be figured out... Could this be a Disney cartoon? This is fascinating. I'm just now reading "Walt before Mickey: Disney's Early Years, 1919-1928" which goes into great detail about the Laugh-O-grams. These should be distributed as part of the WD Treasures tin dvd sets. Mystical Felix Monday: There's More?